This training prepares you for the "intacs™ Certified Provisional Assessor (Automotive SPICE®)" examination. "Automotive SPICE® v3.1" is used to evaluate and improve development processes in the system and software environment. It is the automotive-specific derivation based on the requirements of ISO/IEC 330xx and is a standard recommended by the VDA for the evaluation of development projects at automotive manufacturers and suppliers. 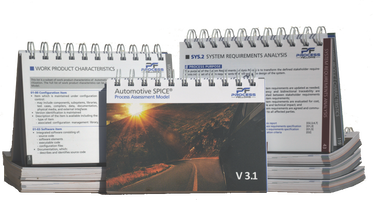 You will get to know the interpretations of the most important processes from Automotive SPICE®, which you need for conducting assessments. You acquire valuable knowledge and hints in order to be able to support a certified Competent Assessor in assessments in your own company or at suppliers, or to optimize processes on the basis of assessment results. To successfully complete the training, you must actively participate in the course and pass the independent examination. Independent preparation and follow-up of the material on each day of the training is recommended. In the case of examination participation, examination fees are added to the seminar price. People who plan to carry out or support assessments according to Automotive SPICE®. Participants should have several years of professional experience in the IT industry (e.g. software/system development, project management, quality management, etc.). Each participant will receive a folder with the training documents as well as a confirmation of participation. The seminar price includes the "Automotive SPICE® v3.1 Pocket Guide". Price (plus VAT): EUR 2,700.00 p.p. Exam Fee (plus VAT): EUR 450.00 p.p. Price (plus VAT): USD 2,950.00 p.p. Exam Fee (plus VAT): USD 600.00 p.p.